Thanks for your interest in a TeachingBooks.net license for your institution. 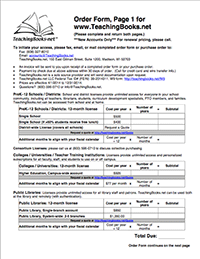 To initiate an order, please download, complete, and submit a TeachingBooks.net order form, or complete our online order form. Payment options: check and wire transfers incur no fee. For U.S. credit card transactions, please add an additional 3%. Call (800) 596-0710 for details. A completed order form on its own will be sufficient to establish your new TeachingBooks.net license. Download and fill out the PDF order form. Fax your order to TeachingBooks.net at (608) 327-8010. What happens after an order is submitted? emails Sent after receiving your order, including an e-invoice. phone call Reviewing tools to help you manage this new license. webinars Customized live training session to support literacy initiatives.